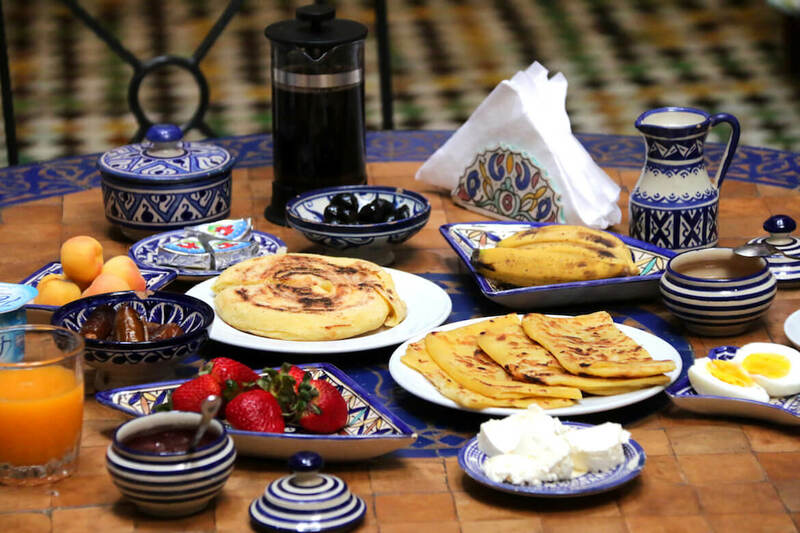 Breakfast is served either in the central courtyard or on the terrace, and includes local breads, cheeses, conserves, yoghurt, fresh fruit, dates, olives, fresh orange juice, eggs done to order and a choice of tea or coffee. A choice of drinks and snacks are available for purchase. Dinner is available upon request, with a minimum of 24 hours notice. Close to the guesthouse is a wide selection of restaurants, cafes and snack bars. If you are renting the whole house and wish to use the kitchen, there is a large food market at the top of the Ta’laa K’bira where you can shop for fresh ingredients. Essential items can be obtained at the little “hanout” shops throughout the Medina.